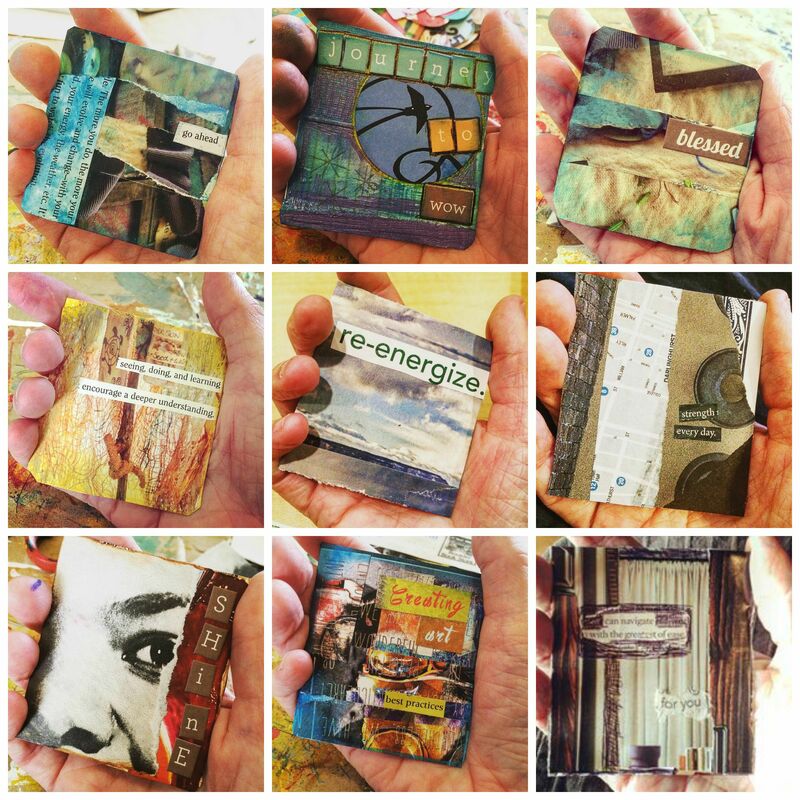 I wanted to offer a quick show & tell of some images from my Make & Do 365 journal. I have found that this daily creative practice has taken on a new level for activating self-care and creating an opportunity of creative refuge. I’ve worked my way through filling the journal’s pages for plans and wishes… and currently finishing pages dedicated to the section on dreams. I use the valuable creative time I have committed to this journal and to myself as a way to connect to a sense of mindfulness, hope, and peace of mind – a process and act that I continue to have much gratitude for and hold sacred. Happy 2017! I hope your year has gotten off on a creative start! I wanted to introduce the 365 project I decided to work on this year: Make&Do 365. Right now I am using a journal I have had for awhile now, Things to Make and Do by Nikki McClure. My intention is to work in it everyday through art journaling, altered art, doodling, and whatever other creative inspiration happens. The journal is divided into several themes: plan, wish, dream, build, explore, learn, make, grow, give, and find. Great prompts to help guide me this year. Since January 1 I have been working on the pages dedicated to planning. Seems super appropriate with the beginning of a new year ahead and thinking about & getting ready for what the next 12 months hold! Enjoy! Today marks the completion of another year of daily creative practice with my annual 365 project…. after being so curious what it would be like to take on this kind of challenge, I am so glad I embarked on one in 2013 on New Year’s Day…. Each year and creative undertaking since has graced me with something new to explore over the last 4 years… Towards the end of my first 365 project, I reflected on the discoveries and reminders it helped inspire. 1. I’m always amazed and astonished by the containment of small holding spaces in art making. Working within a small space has helped me make each 365 project manageable. Time and time again the power that this small space holds in its message, form, and process is awesome to witness. 2. Remember to slow down. This reminder is only one of the important lessons that my 365 projects has gifted me. Taking time out to stop and pause for a moment to work on the day’s image is so important. Sometimes it might feel like there’s no time or things are just so busy that taking this time seems impossible… but engaging in this process helps bring a grounding, focus, and presence that I have come to value and appreciate every day. 3. Appreciate each day. Each creative piece and image is an expression of gratitude for another day. It also allows me the opportunity to be thankful for the moment, which is important to recognize and not take for granted. 4. Trust the process. There are definitely some days that I have struggled to find time or don’t feel as connected to the image I have created in comparison to others, but at the end of the day it all works out. The process of creating everyday outweighs the emphasis on the product. Just like art therapy! 5. I really do have 20-30 minutes everyday to create. Probably one of the biggest surprises after 4 years of consecutive creating! It’s still true! Some days it may have been 10 minutes, sometimes longer than a half an hour, but there was always time within each of the 1460 days. In the spring, I was interviewed by Australian Art Therapist Jade Herriman for her blog about last year’s and this year’s 365 projects. This summer Ohio’s Buckeye Art Therapy Association featured my 365 projects as part of their Featured Artist/Art Therapist interview series. I thank everyone for their support and encouragement with this process over the last four years! It has definitely helped– ❤ I am looking forward to launching another 365 project for the new year ahead. I can’t wait to share it with you! Happy creating in 2017- What are some of your creative goals to focus on in the next 12 months? Behold some of the daily photos I’ve taken and re-worked for Illuminate 365 over the last couple of months! It is inspiring to see them together here. With springtime gradually awakening during this time I have enjoyed capturing and symbolizing aspects of the season to reflect on the illumination theme. A time for re-growth, renewal, as well as gratitude for days that awaken with and contain so much more light, even on the darkest days. It is now month four of my 2016 project: Illuminate 365. Uploading all the photos and captures I’ve taken everyday over this first quarter was a wonderful (yet, a little overwhelming!) opportunity to reflect on the images, concepts, and messages they each convey. This creative adventure has become a daily treasure hunt for illumination- revealed through rays of light, shadows of darkness, nature’s beauty, the morning sun, ordinary objects, warm candlelight, and many, many different places both outdoors and inside throughout this year’s winter season and now the fickle springtime that is upon us…. I’ve taken all these photos on my iPhone- experimenting a lot with app filters (LiveCollage, iLeaker, Instagram, LightEffects) which is quite fun. Another treasure hunt that accompanies this project for me is discovering quotes and inspirations that connect with the image. On this first day of the New Year, I am excited to share the new 365 project I’m about to embark on: Illuminate 365. My intention with this new daily creative practice is to capture images throughout the year that reflect variations on Illumination. In 2012 and 2013 I started regularly taking photos of light with a project I called Through a Grateful Lens. The last few months, I’ve been thinking about how much I’ve missed this practice and the special connection to gratefulness, hope, and comfort these light captures helped inspire during this time. I am curious to discover what a whole year’s worth of captures each day sparked by the expanded concept of light, insight, and understanding will reveal or offer. Bring on Illuminating 2016! My plan is to use digital art making through fun apps and programs to get creative with the images that I take in the spirit of this project and share them in quarterly round ups here on this blog. Daily captures will be shared on Instagram. How would you like to illuminate 2016? Here’s to a Happy New Year to us all full of art and creative goodness! This post is a little pre re-cap about the goings on of the project before it ends on December 31! In previous posts I’ve shared how introducing a daily creative practice into my life has been such a huge benefit. 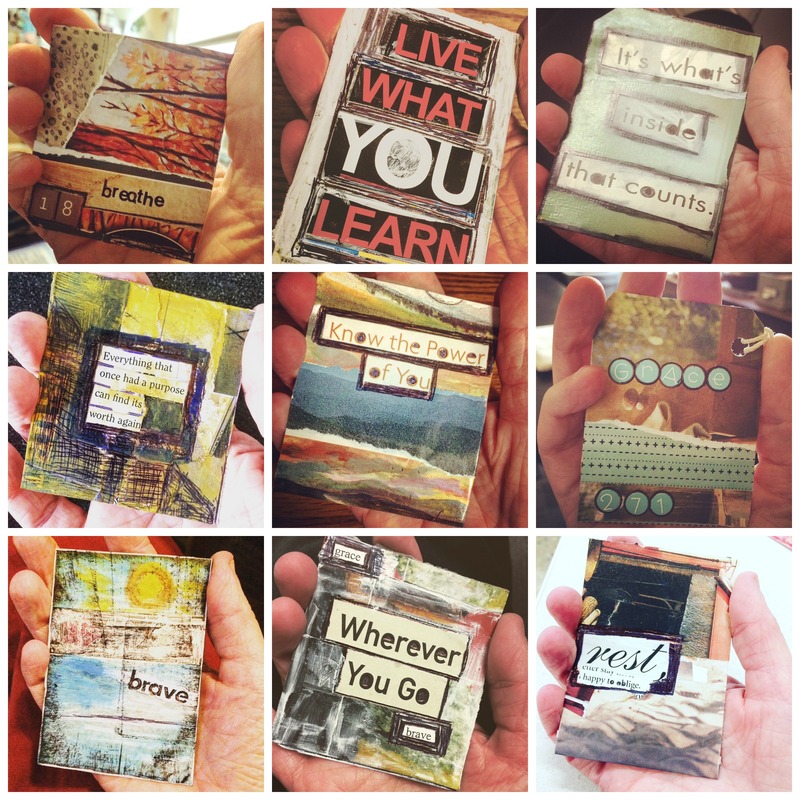 I’ve written about how creating these little pieces of art helps slows things down and take pause in my day. I’ve also stated how those moments where I am most busy or active in my day are the times I feel like I get the most out of this process. For this year’s collection of art I started using half sized index cards, then started to use playing cards- which I ended up really liking the most because of their texture and thickness. I used a lot of magazine photo collage or scrapbooking and printed paper gifted to me in stash swaps, as well as stamping ink, rub on/transfer lettering, & a variety of pens from gel, ink, paint & sharpies. What really inspired this 365 was the intention to give away all the art I created this year. I really enjoyed this part of the project! It was exciting to release what was made and its accompanied message into the universe. Whether someone claimed the creative deed as their own or not, the spirit & energy behind its creation was “out there”. In times of challenge, stress, or moments of tough things going on in the world, I hoped that a creative deed helped bring some kind of light. Equally exciting was where/how/when to release the creative deeds. My favorite public place were gas pumps. The most oddest place I sometimes would put creative deeds on were on the tops of garbage cans. I wondered if it would be an easy way for them to end up as trash? Surprisingly I enjoyed leaving creative deeds out during the winter months because it helped me get out & about in the bitter cold and snow more than I would have without this special mission. I don’t know if anyone ever noticed that I was leaving one behind. There were definitely times that I stayed around (mostly in coffee shops) and could watch the different reactions of someone discovering one. Sometimes they would be picked up, looked at oddly and put down- and other times welcomed with a smile and then claimed. In addition to the public random places I left creative deeds, over the last couple of months I finally finished mailing out creative deeds to everyone who requested one through this blog or social media. I also mailed out some batches when inspired to friends and supporters of the project. From January to December I’ve slowly put these tiny pieces of art in the postal mail here in the US, to Australia, Europe, New Zealand, UK, and Canada. Below are some pics from some of the creative deed deliveries received in December. Awesome to see these captures made upon their arrival and in hands @ their new home! Creative deed delivery to Rosann, Bailey, Theresa & more! I was super curious how inviting others to become involved in the process would work out and in what form. I created the Creative Deed 365 Facebook Group as a space for anyone interested in also spreading this form of creative goodness throughout the year. I had no idea how important this group would become to the process! Not only was it an inspiring, encouraging, and positive place for sharing our creative deed efforts, but I enjoyed seeing the variety of creative deeds everyone involved in the idea were making for others. I hope others did too. 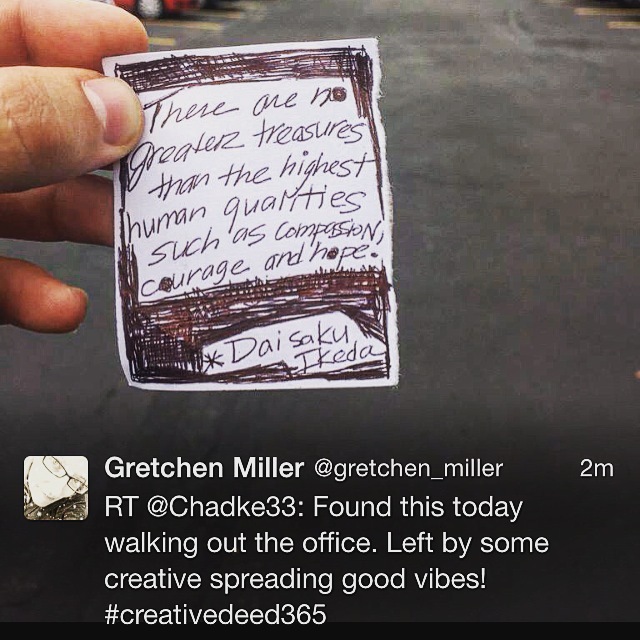 Social media through FB group primarily, but also Instagram with the hashtag #creativedeed365 became another way for ones creative deed energy to be released “out there”. It was also just as fun to invite art therapist friends and colleagues this summer to join in on the #creativedeed365 fun while attending the national conference in Minneapolis. It was like a Creative Deed treasure hunt in the hotel we were staying at. 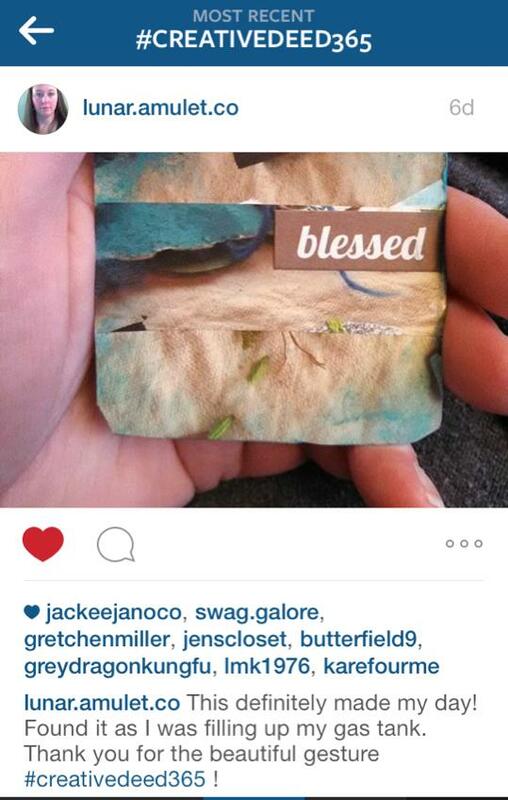 What was always a nice find on my end was when someone who discovered a creative deed would use social media to share the news, using the #creativedeed365 hashtag— again on Instagram and sometimes on Twitter. It was a nice feeling to know the creative deed was received and read the expressions of gratitude, surprise, and joy. The creative deed e-mail was also used on a few occasions to share finds as well! I was also really delighted that Ursuline College, where I am on faculty in the Counseling and Art Therapy Department, became aware of this project and invited me to guest blog for their online publication VOICES last month. You can read this post here. In this post I was able to reflect on how the project started, the role of community & social media, and the creative goodness this effort has hopefully helped spread. “by walking the path, we make the path visible.” -Phil Lane Jr.
Past updates, creative deed work, discoveries, and more from this year can be viewed here. I’ve been using Flipagram recently to document the last few months of offerings. December’s will be coming next week when this year’s project ends! It’s been a super active last couple of months during my Creative Deed making, so I am catching up on sharing my offerings here for the months of September and October! In moments of long days & busy scheduling; having a moment everyday to stop & create truly fosters a sense of centering and opportunity to catch & regulate my creative breath. It’s times like these that this daily creative practice is important more than ever. It’s also a valuable reminder how essential it is to have this commitment part of my day and self care. I breathe in stillness & grounding. I exhale the possibility each deed released into the world could offer to another. So here are the offerings I’ve made over the last 2 months with these quick videos from Flipagram (click on the image to view! )… These little videos are so much fun to create! Happy November and Art On! Wow- Month 8 of Creative Deed 365 has come and went- it flew by! It’s hard to believe there’s just 4 months left of this project!